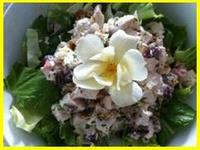 This cool and refreshing Chicken Salad is absolutely delicious! Your family will ask you to make it over and over again and your friends will want the recipe! The chicken is tender and moist with a tasty dressing plus a lovely crunch. And the color is gorgeous! Serve it with crackers or bread sticks. Add 1/4C of the dressing to the chicken mixture, gently mix together and then add a spoonful at a time, as needed. That way, you remain in control of how wet or dry your final product is. Your delicious dish can be served immediately or refrigerated for up to 24 hours. Before serving add a quarter of a cup of Green Seedless Grapes, halved, gently mixed into your chicken salad and top with a fresh flower (grown without herbacides) or top with a small tomato wedge for color. Select a large tomato. Slice off the top and gently scoop out the pulp, leaving a 1/4 inch wall. Mound a generous portion of your mixture in the tomato for a lovely presentation. In place of the celery salt in the dressing add 1-2 tsp of curry, sweet or hot, to your taste. Be careful!